Complex of character houses . 87 Acres of meadows and woodlands . The little town of Mirepoix lies in south-west France in the department of the Ariège, the traditional name for the part of the Ariège that is home to Mirepoix being the Pays D'Olmes. This is a very lovely part of France, and includes some of the beautiful mountains of the Pyrénées. Mirepoix is truly a place where you will want to linger. There can be few pleasures greater than the simple delight of sitting under one of the shady canopies formed by the overhanging houses that surround the square, sipping a coffee or a long cool drink and watching the world go by. The numerous bistros and cafés offer a variety of treats ranging from delicious pastries and gateaux to three course meals and a glass or two of the locally produced wines. 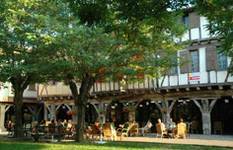 The character of Mirepoix is quite distinctive and the town oozes charm. Half timbered houses line the central square, with their upper storeys overhanging the walkways below. During its long history, Mirepoix was nearly destroyed twice, by both floods and fire, but has been rebuilt and is now considered to be one of France's prettiest towns. Mirepoix is extremely and understandably popular with the English, both as a holiday venue and as a place to purchase property for a permanent life in France. This has had a significant effect on the town, as popular demand has created an English economy! In Mirepoix now you can buy many of your favourite English foodstuffs such as good old cheddar cheese and Kellogg's Cornflakes, as there is a little English shop just off the main square. Strangely, perhaps, this is run by a French lady, but she is extremely helpful and happy to chat. You can also buy English Language newspapers in Mirepoix, find an English estate agent to help with your property search, and even the supermarket, Super U, stocks an unusually high proportion of goods which are specifically aimed at English customers! If all this Englishness is not what you want, you should perhaps remember that Mirepoix is still an essentially French town in a beautiful and rural part of France. The town sits on the banks of the River Hers (pronounce "Airss") and you will still see shepherds sitting by the river with their flocks of sheep and goats enjoying the cooling waters and green grass down there. There are other traditions upheld here too, and the fêtes and festivals that the town is famed for are traditionally French. There is, for example the Fêtes des Pommes or Festival of the Apples, held in the autumn to celebrate the apple harvest. 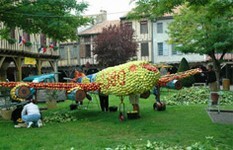 The town square is decorated with massive statues made from apples, and is a sight to behold. Mirepoix also hosts a jazz festival, and a Marionette festival, and at Easter the whole town sits down to eat the Big Omelette at long tables in the square. Just a short drive from Mirepoix is Mont D'Olmes, which is a small and friendly ski resort, and the ruined and tragic Cathar Castle of Montsegur, perched impossibly high on a mountain top. There are caves to explore, and it is a perfect area for many sports and leisure activities. The beautiful Lac Montbel is nearby, offering all manner of water sports, and the lovely countryside of the Ariège is great for walking, horse-riding and cycling. Mirepoix is easily accessed from the UK as it is within about an hour's drive of two airports, Carcassonne and Toulouse. Ryanair run very cheap flights into Carcassonne from Stansted and Liverpool, and flybe, British Airways and easyJet all offer services to Toulouse. It is also possible to take the Eurostar shuttle service from London to Paris, then a TGV fast train to Toulouse. Property prices in the Ariège tend to be cheaper than in many other parts of the south of France. Mirepoix is a very popular town which has seen some considerable growth in property values in recent times, but it is still possible to buy property around the town for reasonable prices. The town's popularity continues to rise and due to the attraction of Mirepoix as a holiday destination, there is a strong rental market so anyone buying a property here would be making a sound investment. Good afternoon - I live in Mirepoix. I have lived in the area fifteen years, moving from another village four years ago when house prices were much higher than they are now. Three years prior to that had seen a soaring of house prices in this area. I need to move back to UK but the value of my house has fallen enormously in the last four years, since buying. I am told as much as 30%. I could have recouped some this by a more favourable Euro/Pound exchange rate, but now sterling is starting to climb back up again, so further erosion here. Unfortunately the part of England where I am relocating and where my family live is one of those hotspots of Britain, so no joy on moving back to cheaper property prices. The cost of living here is also phenominally high - small example, a jar of Rollmops in local supermarket 3.50 Euros - Sainsburys £1.09. If it were only just Rollmops! The best thing to do is continually slim. I tell myself it's much healthier to eat little! I also payed 69 Euros for a mobile phone and saw the same model in England for £20. Yes it's beautiful here, but those who need to move back are having a tough time at the moment. Do you know Mirepoix better than we do? Do you have photos of Mirepoix? The town of Mirepoix is located in south-west France, in the north-east of the Ariège department. Access: By air: Fly to Carcassonne with Ryanair, or to Toulouse with BA, easyJet, or flybe. By rail: You can take a TGV to Toulouse from Paris or Lille. Economy: The economy is mainly agricultural, but tourism is also a factor. Interesting fact: Mirepoix is so popular with the English that the town now has English estate agencies, English newspapers on sale and an English Shop where you can purchase items like cheddar cheese and Marmite!